Since we wrote the post about ReefPearls, we have been asked if we can show them being used. If you don’t remember, ReefPearls are small feeding pellets designed to imitate zooplankton, therefore feeding corals and filterfeeders. The small pellets vary in size from 5 to 200 µm (microns), which is the natural size of plankton, and are a great way to provide high nutritional valued food to your corals. 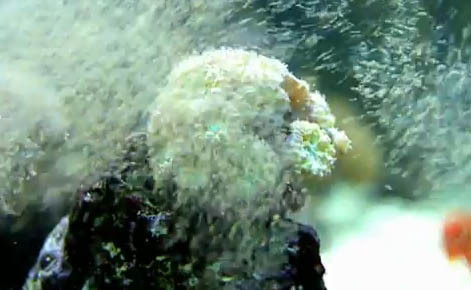 Here is a quick video of a Micromussa feeding on ReefPearls. You can see the immediate reaction to the feeding at 0:32. ReefPearls are brought to us from the manufacturer of NP Reducing Biopellets, and PO4x4 Phosphate Remover. NOTE: although we do believe this video is of a blastomussa merletti, we have not re-titled it. Definitely picking up a pack and trying it out. Nice video, but isn’t that blastomussa merletti? I think so Clive. I think the video is mis-marked.